I think my dog is really sweet she never bites or ever hurts you unless you are a stranger she does not know. she saved my family once I lit up bells to brighten the room better, and I left the room with my daughters and opened the door to let the Mia out and play and I fell asleep with my daughters and she woke me up to bring her in and when I did that she went straight into my room and started barking. So I wanted to see what was wrong and I got very scared it was a big fire I hurried to get the fire extinguisher and put it out .that day she did not leave my daughters side and mine. This day we are more safe than ever. She is a joy to our life she has brought us more together as a family. she is like a sister to my daughters and I. my daughter had a bullying problem in school and one day a group of girls were bugging her when she was almost home Mia new what was going on and thank you god she came just in time before they hit my daughter she started growling and pretended to bite at them and they got scared and ran away my daughter didn't get hurt but since then the girls did not ever bully her around. 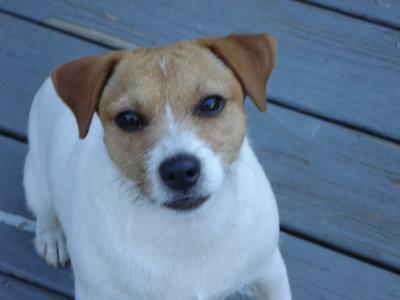 she means a lot to our family and friends I hope you choose Mia so show people how great jack Russells are. Mariza, this little dog saved your life. Thank you so much for sharing this wonderful little dog with us.